Welcome to the Tuesday Stamp Ink Paper Challenge, with this great sketch. The cardstock I've chosen is Rose Red, Soft Sky, Cucumber Crush, Smoky Slate, Whisper White and Basic Black. I saw this great idea in one of the groups I'm in to use the Thoughful Branches bundle to make a cute sheep. I'd like to thank Judys Creations as I cased her sheep. I didn't have exactly the same punches as she used but I used the Leaves from May Flowers framelits for the ears, the Owl punch for the face and eyes. One of my little flower punches for on top of the head and the Bow builder punch for the feet. I also got to use my Fringe Scissors on the grass. The patterned paper used on the background of my card was called English garden. Here's a closer look at my sheep. Thanks so much for stopping by today. 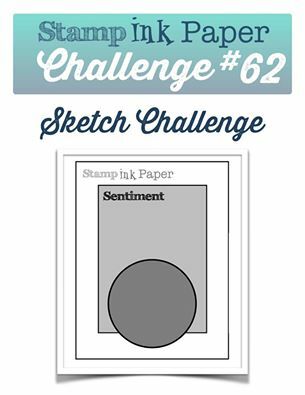 We can't wait to see what you create with this week's sketch at Stamp Ink Paper.